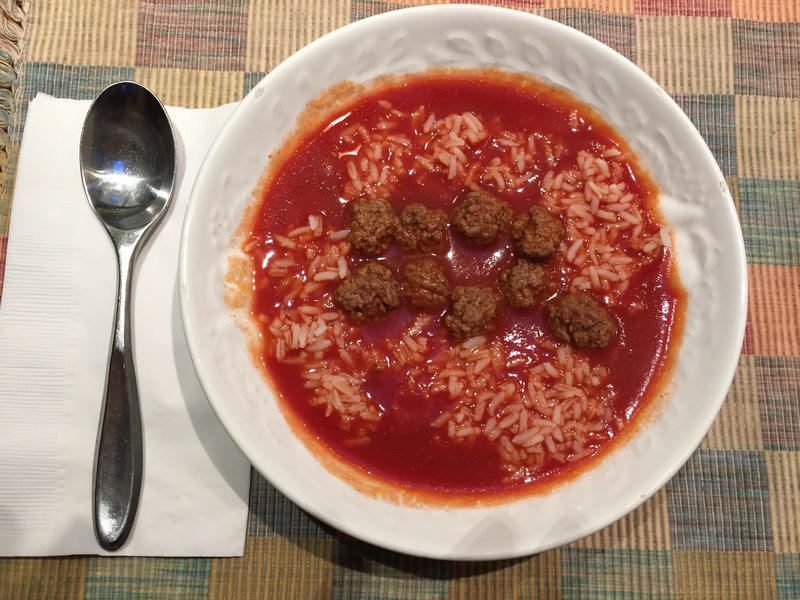 Mom’s tomato soup with tiny meatballs was no ordinary tomato soup; it was soup steeped in love, the love of cooking, standing over a simmering pot of redness, tasting as she curled her tongue along her lower lip. Circa 1944, a time in elementary school when I came home for lunch to join the entire family, even dad. Mom’s tomato soup with tiny meatballs was a winter’s day soup, savory and tart with a tad of sweetness underneath. Just yesterday, I simmered a newer version, the addition of a carton of organic beef broth, suggested by my younger sister who uses actual beef or chicken bones to make the stock. We have the same mother and one would think that since we are only two years and nine months apart that we would have the same recipe; but that was not the case. On the occasion of preparing the soup for a friend with recent surgery, I pulled out the recipe from my “Tried and True” green metal box. The first ingredient, a cause for laughter, was a 15cent can tomato juice. The recipe is written in my small twenties script, likely 1956 around the time I married and gathered recipes in a pre-nuptial, preparatory panic. I cannot remember, but assume that a 15cent can of tomato juice equaled a quart. As a bride and young mother, I made Mom’s tomato soup frequently. But never before this past week did I enhance it with beef stock. Did it make a difference? Nutrition-wise, of course the broth enriched the protein and B12 content. But taste-wise? How to explain the sense of greater depth, a shift away from the bracing acidity, all of which created a richer sensation for the palate? My note of a 15cent can stirred a pot full of memory: Mom and I in the kitchen a week before my marriage, Mom dictating recipes she was certain my future husband would enjoy while I wrote, one recipe after the other, on 3×5 cards. The tomato soup card seems hurried with clipped directions, probably why I left off the broth. I’m glad I checked with my sister and updated the recipe with the flavor of beef and a little sugar. I’m glad my friend savored the soup and hope, in some way, it added to her healing. It is so rare that I take out the red enamel stockpot. I am grateful to have made a vat, enough extra for several lunchtime servings for my husband, my daughter and granddaughter. Mom always made extras. It’s no wonder I have so many kitchen memories like Walter the blind broom salesman with a cane who came by the back door once a year. In my minds eye, he forever sits at the kitchen table, bent over a steaming bowl of soup, quiet in his gratitude. This entry was posted in Happiness, Relationship(s), Uncategorized, Well-Being and tagged a pot full of memory, a winter's day soup, savory and tart on January 11, 2016 by fayewriter. When I read this piece it made my mouth water and made me think family. I appreciate the attention to not only what goes into this savory tomato soup, but also to what emerges while it’s being cooked and consumed: aromas, tastes–and the memory of an earlier self. Nice inclusion of the mystery around two “authentic” recipe versions, and I like that you left this an open question! I appreciate your noting two authentic recipe versions. Both/and has far greater appeal and possibility than either/or!